We love this twist on classic corned beef and cabbage from Senior Contributor Chris Prosperi. Must be because we can’t get enough of that cousin of the cabbage, Brussels sprouts. They’ll soften and become tender in the last 30 minutes of the stew’s cook time. Serve with the easiest sauce of all time: a simple mix of really good mustard and sour cream. Place the corned beef chunks and spices from the packet in the slow cooker. Top with diced onion, chopped carrots, and chopped red potatoes. Pour in the beer, cover, and set on low and cook for 8 hours. Then place the halved Brussels sprouts into the crock pot. Cook for an additional 30 minutes or until the sprouts are soft. In the meantime, mix the mustard and sour cream together and set aside. Then ladle the stew from the slow cooker into bowls. Serve with the mustard sauce on the side. I tried it. I was surprised that the stew was bitter from the beer. Anybody else get this result? 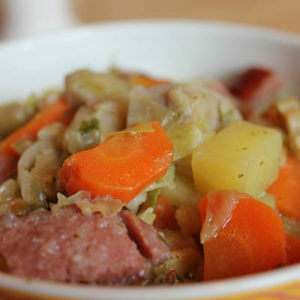 I tried this recipe today….agree it was bitter, briny and not as tasty as traditional new england boiled dinner.. I liked using brussel sprouts in place of cabbage..which I will use next time I cook corned beef. briny is how my husband described it – we liked the brussel sprouts too. After reading your comments about the bitterness, I changed it up a bit. It’s a 2 day process, but well worth it. Cooked the corned beef & 2 yellow onions & spices with a bottle of non-alcoholic beer for 6 hours. Pour it in a bowl to let it cool. Cover and put in fridge. 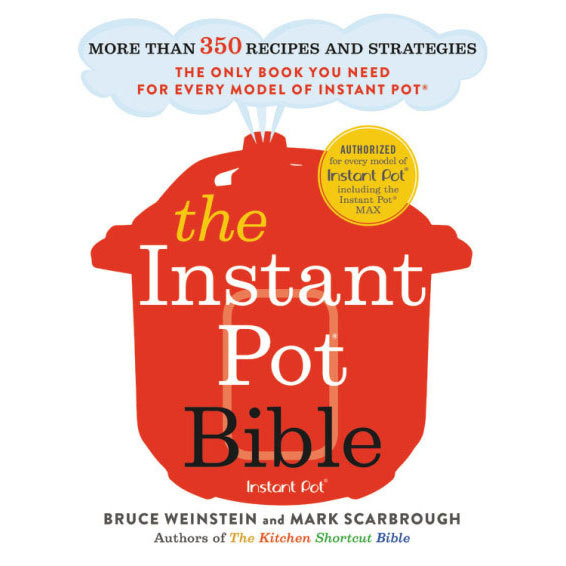 Next day, put the meat only back into the crockpot – right from the fridge. Pour two small cans of low sodium chicken broth and one large can of diced tomato over the meat, cut veggies as directed above and cook 2 more hours. If the veggies are not done, you can cook them on stove top with broth from the crockpot. Voila! No bitter taste & the tomatoes add another layer of flavor. For beer, I used Libation Propaganda Coffee Stout by Outer Light Brewing Company (I love CT beers). To counter the potential bitterness I saw noted above, I sprinkled in just a little brown sugar. If I had tapped my maple trees this year, I would have used a small drizzle of maple syrup instead of the brown sugar. I thought that this came out absolutely amazing! Eric, we’re so glad to hear it. Love your ideas for improvisation, too! I do Guiness braised corn beef every year. But first I soak the brisket in water for 2-3 hours and change the water several times. Then cook in Guinees for 8-10 hours. I add the spice packet, garlic powder and bay leaf. Also I use Guiness stout. Never comes out bitter.